I found this recipe over at Stephanieskitchen.com. It is delicious beyond words. We will make it time and time again. Cook bacon until crispy in large soup pot. Set bacon aside on paper towel and add sliced leeks to bacon grease in soup pot. Saute leeks for 6 to 8 minutes. Add potatoes, chicken broth, salt, pepper, thyme and parsley. Bring to a boil, reduce heat, cover and simmer for 20 minutes or until potatoes are fork tender. Add half of your soup mixture to blender or food processor and puree until smooth. Add back to soup pot, adding half and half. Stir until well combined. 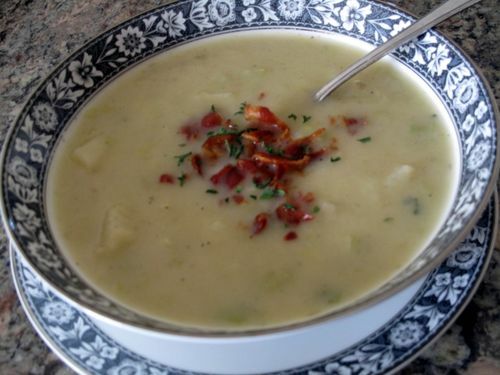 Serve in soup bowls and top with crumbled bacon and a dash of parsley.